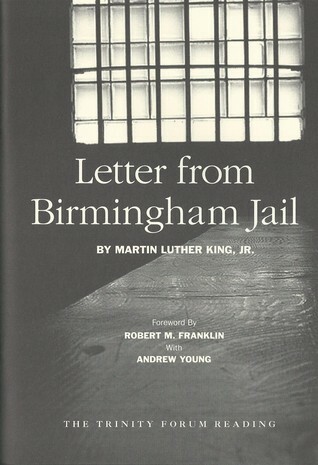 As we mark the Martin Luther King, Jr. Day, we'll read and discuss the "Letter from Birmingham Jail" (circa April 1963). This meeting is intended to be a small group discussion to allow a robust exchange of views and ideas. The discussion will be focused on a close textual analysis of philosophical insights from this historically-significant document. - Do any universal themes emerge from the text? - Who is the intended recipient of the letter and has he pursued the reader or the audience? - Do you find the moral, philosophical, and religious references to be relevant and persuasive? - Is this document still relevant in today's society? If so, how? IMPORTANT: the reading assignment is mandatory, if you wish to attend.